Before I begin: don’t forget that I’m making a complete fool of myself hosting a Facebook Live launch event today–9pm Israel time (3pm EST; we just changed our clocks, so it’s 6 hours’ difference instead of 7)! Make sure to “like” and follow my author page on Facebook to receive a notification when I go live. In the meantime, you can peruse the excerpts I’ve been posting on the event page and join the discussions about them! I’m a very musical person and I use music as part of my emotional processing. Naturally, this flows over into my writing; finding music that matches the situations my characters experience helps me process what they’re going through and dig deeper into their emotional lives. The concept for By Light of Hidden Candles was inspired, in part, by a song; a Judeo-Spanish folksong called Hija Mia. That song ended up in the epigraph of the book and makes a few appearances within the story. I put together a YouTube playlist of some of the music I associate with By Light of Hidden Candles. It’s quite an eclectic list! Here is the playlist, and below is an explanation for each song and how it relates to the book. See, it will carry you away. 2) Lens/Alanis Morisette: This is a song about tolerance and in a sense, interfaith dialogue. It feels like a good overarching theme song about the process Alma and Manuel and Míriam and León go through in learning how to navigate their differences. 3) Hija Mia/Amina Alaoui: This is a different version of Hija Mia with a very different and probably more authentic Andalusian/North African sound. 4) Los peces en el río/Gipsy Kings: This is a Spanish Christmas song that Manuel’s father used to sing at Christmas-time, mentioned on page 86. I chose this version because the Gipsy Kings are from Andalusia, and I can totally picture Miguel Aguilar loving this interpretation. 5) Vehi She’amda/Asaf Neve Shalom: On pages 71 – 72, Abraham reassures Míriam with this quote from the Passover Haggadah: “For not just one has risen to destroy us, but in every generation they rise up to destroy us, and the Holy One, Blessed be He, saves us from their hands.” This passage gives me goosebumps every Seder night, not only because of how true it is, but also because that line is as old as the Talmud–meaning that my ancestors uttered those same words for around 1,500 years, through crusades, inquisitions, pogroms, massacres, holocausts, wars, and intifadas. This is the traditional melody I grew up singing at my Passover table. 6) Vehi She’amda/Yonatan Razel: This is a contemporary melody, composed by one of my favorite artists. 7) Primavera/Ludovico Einaudi: I was listening to a lot of Ludovico Einaudi’s music during the period in which I was writing the book. I associate this piece with Míriam’s nighttime escape from judería (page 133 – 137). 8) Shalom Aleichem/Asaf Neve Shalom: On page 126, Manuel describes the singing around the Chabad Shabbat table: “It was a song about greeting angels, and something about the haunting melody raised the hairs on the back of my neck.” This is the traditional tune I grew up singing at my Shabbat table, and mostly likely the one Rabbi Uri would sing. 9) Eishet Chayil/Asaf Neve Shalom: Also on page 126: “Next came the Biblical song ‘Woman of Valor’, which Rabbi Uri sang in its entirety while gazing at his wife with such visible and intense affection that I could hardly bear to look. I found myself watching Alma instead…” This is the traditional Ashkenazi melody I grew up with. 10) Eishet Chayil/Ehud Banai: This is a traditional Sephardi/Mizrahi melody. 11) Distance/Christina Perri ft. Jason Mraz: This is a song about forbidden or unspoken love. I associate it with the trip to Granada toward the end of the book. 12) 1000 Times/Sara Bareilles: Same as above. 13) Dietro Casa/Ludovico Einaudi: This piece… the sense of longing it evokes led me to associate it in particular with the thought processes described on pages 235 – 236 and 254 – 256. 14) Hixa Mia/Ana Alcaide: Another version of Hija Mia–this one performed at “El Tránsito” synagogue in Toledo, which Alma & Manuel visit on page 202. 15) Where I Stood/Missy Higgins: I associate this with a particular train ride on page 302 – 304. 16) All This Time/OneRepublic: 500 years is a long time to wait to close a circle! 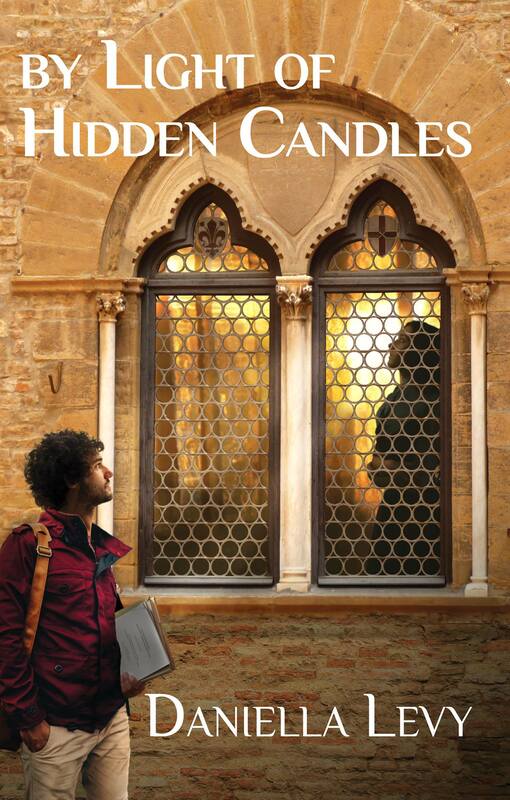 Is there a song or instrumental piece that makes you think of By Light of Hidden Candles? I’d love to hear about it!